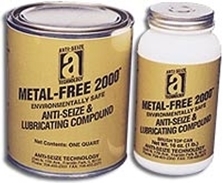 Metal-Free 2000™ is a non-metallic, heavy-duly, anti-seize lubricating compound. It offers extreme-pressure additives, water-resistant properties, and rust and corrosion inhibitors in a high-performance carrier. Protects to 2400°F (1315°C). Used in all industries where corrosion, extreme heat, and pressure are major factors. Exceeds MIL-PRF-907F specifications. Compatible with stainless steel and nickel alloys.